Since I posted this yesterday on ADV, I figured I’d post it here, too. Here’s my review of my Sierra Designs Sirius 2 tent. Interior Area: 31 sq. ft.
Vestibule Area: 4 + 4 sq. ft.
As you can see, the tent perfectly holds my Aerostich High-Tech cot — though a taller rider might find that their bag rubs up against the tent walls in the night. I’m only 5’1″ and the very bottom of my bag is often damp from condensation when I use the cot (even with the vestibules staked out). The vestibules are great for my boots and riding gear (I keep my helmet and tankbag inside the tent — I don’t like a wet or buggy helmet in the morning!). It has a LOT of ventilation for summer camping, which is my preferred time to camp anyway. I don’t have a photo of the tent with the fly off but I’ll take one the next time I camp. I also attached a Sierra Designs portable attic (manufacturer pic here) and leave it in the tent at all times. I put my Brunton Glorb LED lantern in the attic at night and can always see the tent from the outside (and can easily maneuver around or read in bed via the light). The Sirius 2 is really easy to set up due to the clip system of the poles (no sleeves). It takes me about 5 minutes to set up, including lining up the footprint and clicking together the poles. I pack the footprint and poles/stakes separately from the rest of the tent; the tent itself (including the fly and attic) fit in a Medium sized Granite Gear compressible stuff sack. The coldest weather I’ve camped in with this tent so far had an overnight low of 35F. The warmest so far has been an overnight low of 47F. 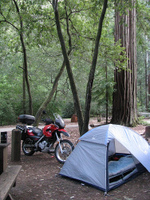 This tent came highly recommended from Becca, moto-camper extraordinaire, and I have to agree with her assessment. Two thumbs up! This entry was posted in Camping, Stuff! Stuff! Stuff!. Bookmark the permalink.